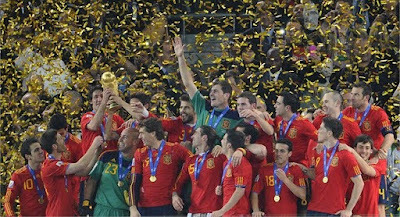 SPAIN WON THE WORLDCUP 2010, Iker Casillas is the man. 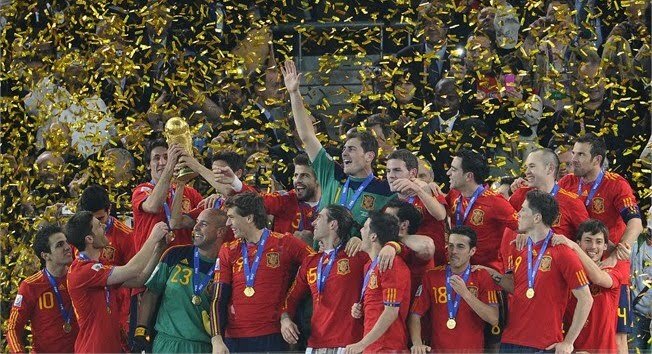 Nah nah, who knows, Spain won the world cup tournament. At first, i thought Germany was going to win this time. However, they did not perform well enough in the semi final against Spain. They did not fight for goals but emphasized more on defense and lose the chance to get in the final. * SAD* But Spain deserve the championship as they did really well. Plus, Spain got an incredible goalkeeper Iker Casillas to hold on their defense so they have no worry but continue to attack. He performed extraordinarily well on every single game. I have to say he is the man. Without him, Spain will never get into final. He is also the captain of the team. He nearly burst into tear when he first get hold to the world cup. i can see how happy he was at that time. He also earned a nickname "San Iker" which means Saint Iker for his amazing saves. He also won the Golden Glove award for his total 17 saves. Also, the main hero, Andres Iniesta kicked in the main goal that gave Spain its first world cup. I was wondering why he took off his blue jersey to reveal a white shirt. I can't read Spanish, but i goggled it, it wrote " Dani Jarque: siempre con nosotros - "Daniel Jarque: always with us". Both of them were teammates on Spain when they was 17. Danu died frim an heart attack a month after being named captain for espanyol. Lastly, Spain managed to survive a tight and intense game. 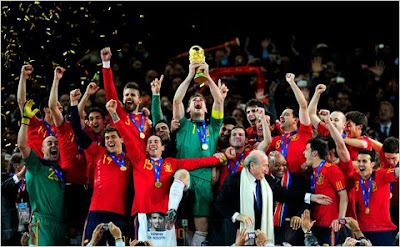 Thanks to Paul, the octopus, Spain is the winner !!!!!! Can't wait for the next world cup tournament, where will i be then?